Köttigite is a rare hydrated zinc arsenate which was discovered in 1849 and named by James Dwight Dana in 1850 in honor of Otto Friedrich Köttig (1824 – 1892), a German chemist from Schneeberg, Saxony, who made the first chemical analysis of the mineral. It has the formula Zn3(AsO4)2·8H2O and it is a dimorph of metaköttigite, which means that the two minerals have the same formula, but a different structure: köttigite is monoclinic and metaköttigite is triclinic. There are several minerals with similar formulae but with other cations in place of the zinc. Iron forms parasymplesite Fe2+3(AsO4)2·8H2O; cobalt forms the distinctively colored pinkish purple mineral erythrite Co3(AsO4)2·8H2O and nickel forms annabergite Ni3(AsO4)2·8H2O. K.
Köttigite is soft, with Mohs hardness only 2.5 to 3, even softer than calcite, which has a hardness of 3. It is also fairly light, with specific gravity 3.33. Because of its sheetlike structure, it has perfect cleavage perpendicular to the b axis; it is flexible and has a fibrous fracture giving it a silky luster on cleavage surfaces. It is soluble in acids. 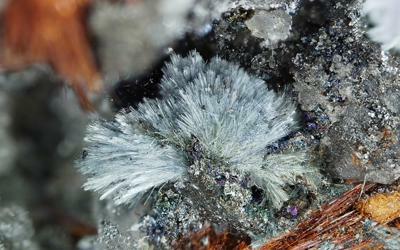 Occurrence – A rare secondary mineral in the oxidation zone of some zinc deposits. It is formed by the alteration of smaltite (Co, Fe, Ni)As2 and sphalerite ZnS. 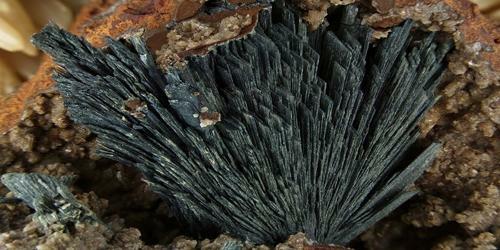 in oxidized zones of arsenical ores containing zinc. The type locality is the Daniel Mine (St. Daniel Mine), Neustädtel, Schneeberg District, Erzgebirge, Saxony, Germany, where it occurs in oxidized veins in a hydrothermal sulfide ore deposit, associated with roselite Ca2(Co2+, Mg)(AsO4)2·2H2O.